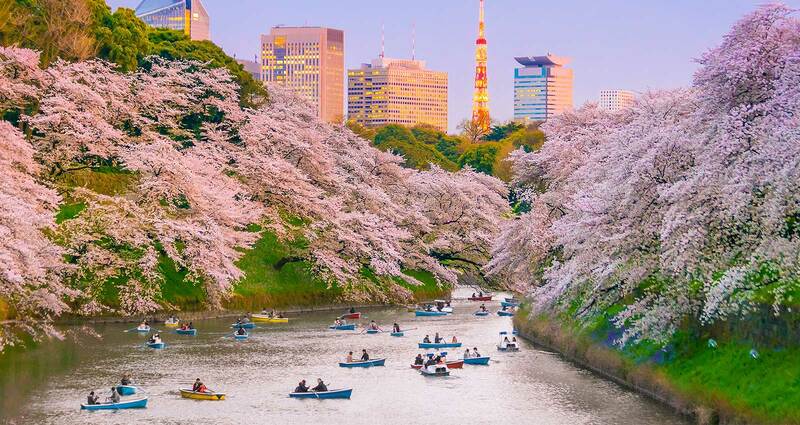 Every spring in Japan, people gather under the gorgeous pink haze of cherry blossom trees or as cherry blossoms are called in Japanese—sakura, to watch the picturesque new bloom during the Hanami Festival. According to Japanese folklore, when the mountain deity visited the human world to help the fruitful harvest of rice paddies, they travelled on cherry blossom petals, making the cherry blossom a sacred tree. Hanami (flower-viewing) is a tradition dating back to the 9th century, when Japanese emperors served a picnic, complete with food and sake, during viewing parties in their court. The tradition then spread to Samurais and soon to the masses. Since then, it has been going strong in Japan and continues to bring people together. Today in Japan, during Hanami Festival, thousands of people gather in parks to picnic under the fragrant flowering trees. As the pretty pink blossoms fall, people savor cherry blossom inspired sweets like Hanami Dango—dumplings in three different colors—pink, white and green that symbolize the change of the seasons. Barbecues are also popular, as well as chirashi sushi, matcha tea and a host of other yummy snacks. Sometimes, the festivities go late into the night and become a yozakura or night sakura. At night, the cherry blossoms evoke a different kind of idyllic atmosphere. They sparkle beautifully under street lights and are decorated with traditional Japanese lanterns. During a yozakura, people enjoy viewing the pretty blossoms while sipping sake. In Japanese culture, cherry blossoms are a symbol of all that is temporary in life, because they bloom beautifully, but only for a short while. Therefore, people are encouraged to pause to enjoy their fleeting beauty, before they’re gone.